Sparking sockets is a common issue for homes and businesses across the country. But what do these sparks mean? And why are your sockets sparking?Well, here a Walker Electrical, we are Preston’s leading electrical professionals. From commercial properties, to industrial and residential settings, we provide a range of high quality, professional electrical solutions across the North West. This includes tackling sparking sockets. As a result, we have produced this guide to everything you should know about sparking sockets. Harmless sparks- When an appliance is plugged in to the mains, or turned on, electricity is transferred from the circuit, into the appliance. This can be a rapid process, and can sometimes result in a small, brief spark of static electricity. This is not something to worry about in most cases. 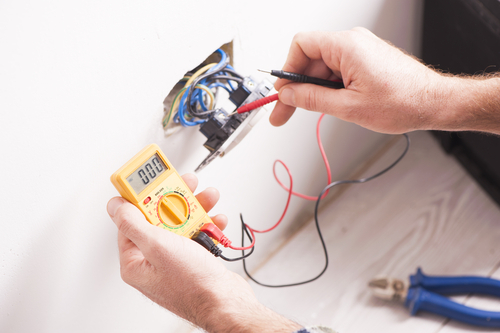 Short circuits- if there is a fault or bad connection at some point in the electrical circuits of your property, the electricity can actually short circuit. This causes all of the electricity to pass a particular way, instead of being diverted along different paths. This surge can cause sparks and you might even hear crackling. You may see sparks around a plug that is already switched on, and in use, or when you plug an appliance in. This electricity can even cause electrical fires if it comes into contact with flammable material. You will need to get in touch with a professional electrician to check the condition of your internal wiring. This is more common with older homes where age has worn down wiring and connections. Water damage- Any exposure to water can result in sparks, and cause the circuit to short. For more information or advice, or for professional support, get in touch with the team today, here at Walker Electrical.